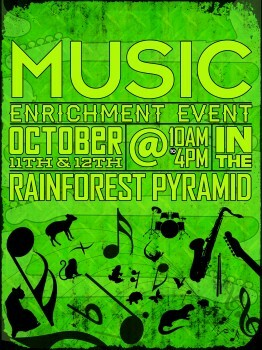 Jam out with the animals of the Rainforest Pyramid at our Music Enrichment Event this Saturday and Sunday October 11-12 between 10 a.m. and 4 p.m. Animal enrichment is something that stimulates the senses or changes the environment. Several categories of enrichment are then used to enhance that species’ behavioral, physical, social, cognitive, and psychological well being. This event, focuses on the auditory and vocal abilities of animals in the Rainforest Pyramid. Using music is just one of the many auditory ways that we can stimulate the animals. To them, it is simply a different sound. This replicates the various sounds they might encounter in the wild. Stop by to enjoy the music with some of our most popular animals. Send us your pictures on Facebook, Twitter or Google+ using the hashtag #MGEnrichment so we can see it and share them too. As we mentioned in our earlier blog post, Moody Gardens is dedicated to our mission of supporting plant and animal programs. We are a public, non-profit educational destination utilizing nature in the advancement of rehabilitation, conservation, recreation, and research. We’ve already discussed the Medical Plant Program, the Beneficial Insect Program, and the Coral Propagation Program, but we are also dedicated to our Saving Elkhorn Coral program and our partnership with United States Fish and Wildlife. Recently, a Moody Gardens biologist and twenty other U.S. and European scientists embarked on one of the greatest coral conservation efforts ever undertaken. They traveled to Mayaguez, Puerto Rico, to use their knowledge to help save Elkhorn coral. Elkhorn coral is listed on the federal government’s Endangered Species Act, and is also essential for the growth of existing and future coral reefs. Without Elkhorn coral, the reef builder, coral reef, and its inhabitants could be lost. The lost of the coral reef would be immense for a variety of reasons. They serve as storm barriers for the coastline, are a potential source for pharmaceuticals, and support 85% of the tourism in surrounding areas. Moody Gardens is hoping to support the cause through captive coral sexual reproduction and husbandry techniques. When certain animals or live specimens are confiscated from people who possess them illegally, Moody Gardens assumes care responsibilities. 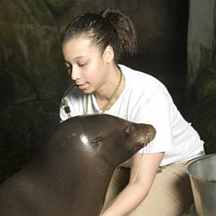 Moody Gardens will care for these animals while their cases are pending and handle long-term care by assisting with relocating them to other facilities. Animals included in this partnership include turtles, Panamanian golden frogs, Cuban Amazon parrots, and the Wyoming toad. 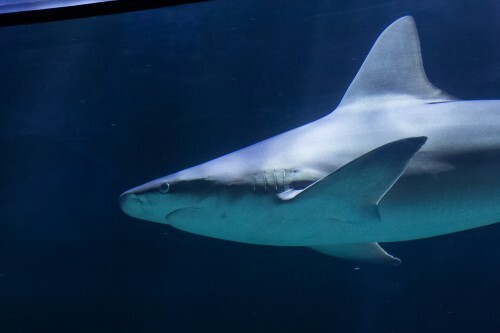 Learn more about the many research programs Moody Gardens is involved in by visiting us on your next family weekend getaways in Texas. Exploring the Aquarium Pyramid and Rainforest Pyramid is an opportunity to learn and have a good time. 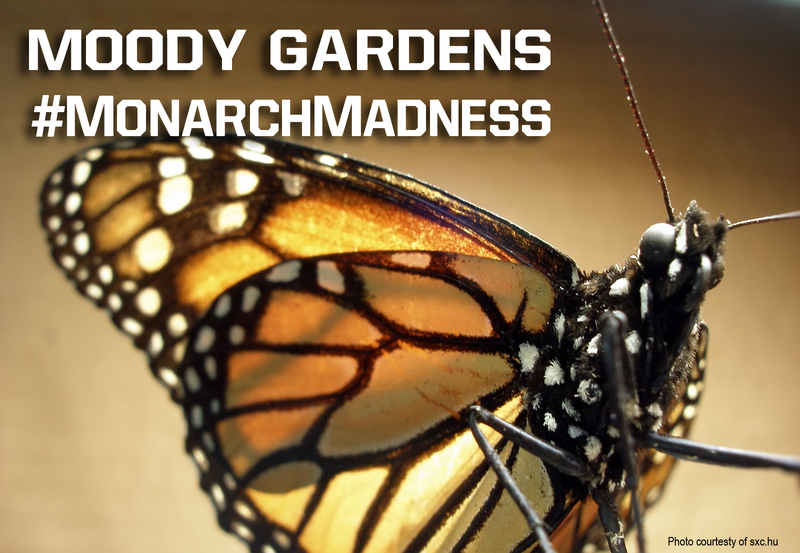 There is more going on at Moody Gardens than what visitors get to experience. We are doing tons of important work behind the scenes to pursue our mission of supporting plants and animals. Moody Gardens has teamed up with various universities, medical experts, and professionals to create research programs for medical research and other conservation efforts. Through the Medical Plant Program, Dr. E. Arthur Bell and the Moody Gardens Horticultural department have collected and grown vegetation from the rainforest that may be helpful in controlling diseases, such as cancer and AIDS. Plant cuttings are sent to the University of Houston for data research to study certain healing properties. With the unmatched help of Sam Houston State University, the Rainforest Pyramid functions without the use of pesticides. This is made possible by an effort to match insects with certain bacteria to balance nature. The program’s hope is that biological control of insects will one day replace pesticides worldwide. 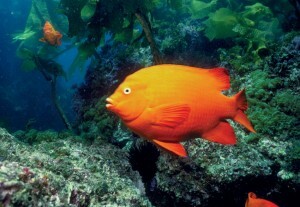 Coral reefs have the second-most diverse population of species, second only to the rainforests. Since so many species depend on coral reefs for survival, the conservation of this natural resource is vital. Through our captive coral propagation program, we conserve coral specimens for use in public aquariums to reduce the need for acquiring wild specimens. Moody Gardens is also a part of a research program with John Hopkins University. The results may have significant direct applications in paleontology, biochemistry, and possibly an indirect effect on medial research. Each year, Moody Gardens makes an effort to bring attention to parts of the world and certain animals in need of support. This past year was the Year of the Bat, as declared by the United Nations. 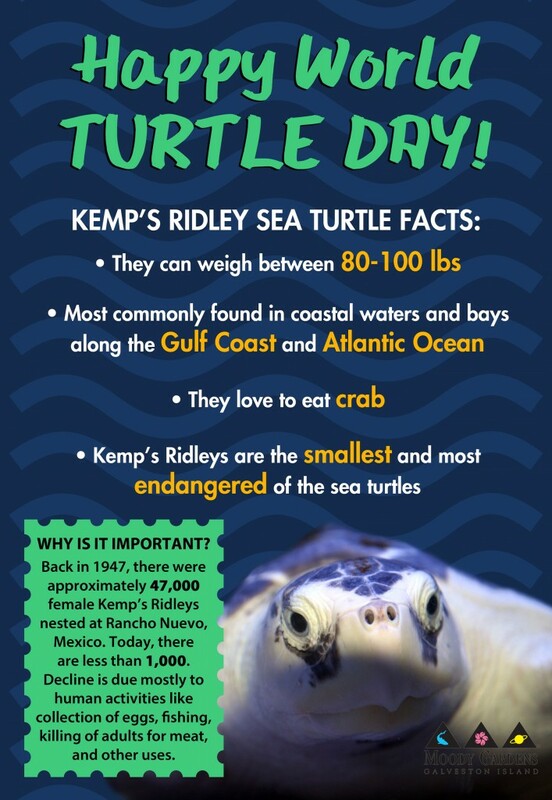 Throughout the year, a variety of events were held at Moody Gardens to bring attention to this important animal, which is often overlooked. Moody Gardens to raised money to donate to Bat Conservation International (BCI). 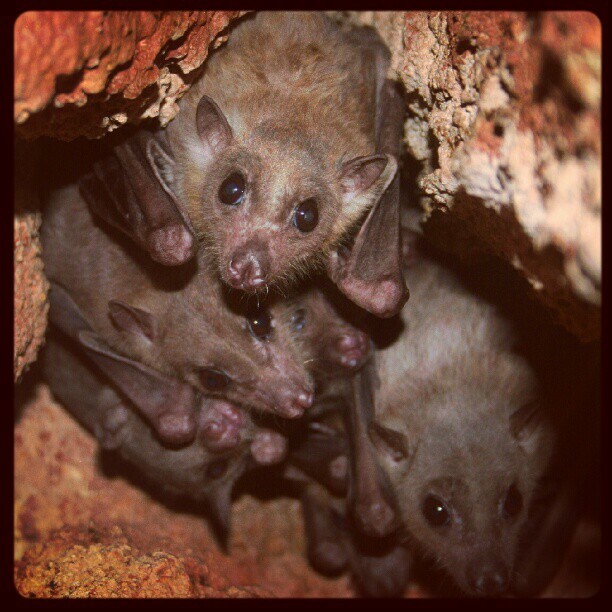 BCI conducts and supports science-based conservation efforts for bats around the world. They work with many other organizations to combine research, education, and direct conservation to maintain bats’ environments and survival far into the future. One of the first events at Moody Gardens was the Bats Are Doin’ It: A Fundraiser for Animal Lovers. The event was held in February at the Moody Gardens Visitor Center and tickets ranged from $50-$90. Proceeds from ticket sales (including raffles) and donations were donated to Bat Conservation International. The event also brought attention to the ecological importance of bats, such as eating harmful insects and pollinating crops, such as bananas and mangoes. The purpose of the event was not only to raise funds, but also to increase appreciation for the misunderstood species. A second Year of the Bat event held at Moody Gardens was the Bats for Bats Fundraiser. Starting in October and going on for several weeks, Moody Gardens held online auctions of sports memorabilia. Items such as a Texas Rangers’ Michael Young autographed photo were sold and the proceeds donated to BCI. Now that 2012, the Year of the Bat, is over, we are looking forward to any future conservation efforts Moody Gardens will be making! Come visit us on your next family weekend getaways in Texas, and learn more about the animals of the Aquarium Pyramid and Rainforest Pyramid. Be sure book your stay at the Moody Gardens Hotel. 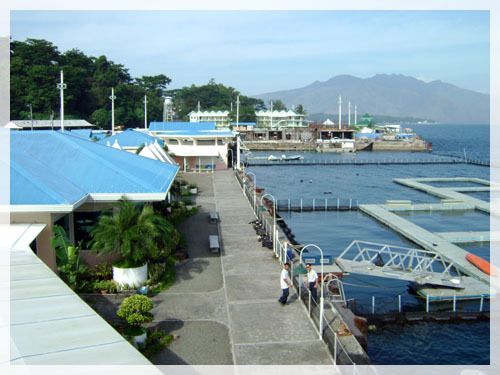 Earlier this month, members of the Moody Gardens animal care team traveled to the Philippines to begin a conservation partnership with a marine aquarium facility in Subic Bay. The project partners Moody Gardens with a nonprofit organization known as Wildlife In Need (WIN). This project pairs resources with conservation needs in one of the most biodiverse ecosystems on the planet. WIN is the nonprofit arm of Ocean Adventure, Southeast Asia’s only open water marine park. It is nestled between one of Luzon’s only remaining intact primary growth rainforests and a marine-protected area that includes two small bays on the southern shore of the mouth of Subic Bay. There are three primary goals for the trip – to formalize a Memorandum of Understanding, develop a coral reef conservation program, and explore terrestrial conservation opportunities. 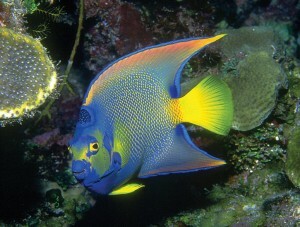 The Moody Gardens team is working with additional field conservation partners including the California Academy of Science, the Florida Aquarium and SECORE.org to design a land-based coral nursery lab, and begin long term coral reef habitat monitoring as the first step towards active restoration work. Following the trip, Moody Gardens’ staff will provide direct and in-kind support, as well as technical assistance, in building the coral nursery lab. Their ultimate goal is to establish a facility similar to the SECORE lab at the Curacao Sea Aquarium. It will support technical workshops and regional reef restoration efforts at the same time that it serves a public education role as an aquarium exhibit. Please refer back to the Moody Gardens blog for updates from the field. 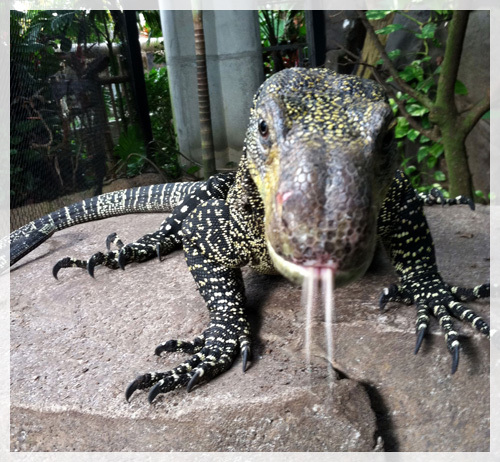 Sunday was Reptile Awareness Day and we’d like to make a belated tribute to one of the reptiles in our Rainforest Pyramid — Mr. Awesome. Mr. 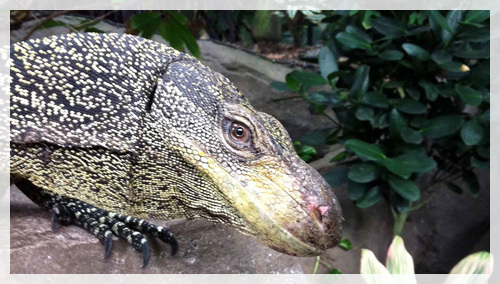 Awesome, or more commonly known as the Crocodile monitor, can be found in mangroves and rainforests in Papua New Guinea. Unfortunately, they are facing pressures of habitat destruction and pet trade. So what makes him so awesome? Well, he’s one of the longest lizards out there. Including his tail, he’s about eight feet long. Mr. Awesome is a fast runner and a great climber, making it hard for his prey to run away. And if you’re lucky, he’ll smile and show you his long teeth — the longest of any monitor. He eats a variety of prey, from mammals to birds to eggs and even carrion. But the best part, like all of the animals in our Rainforest Pyramid, is his behavior. Mr. Awesome is quite attentive to our keepers. We’re in the process of teaching him basic husbandry behaviors, for maintenance and emergencies, and he’s showing signs of intelligence similar to a dog – but in his own stubborn way.